Nature’s Sunshine Healthy Start includes two Nature’s Harvest drink mixes and one 60-count box of Super Trio. Together, this program provides a rich source of essential vitamins and nutrients for healthy living. Nature’s Harvest Drink Mix offers a vegan, all-natural source of protein and 75 percent daily value of 18 vitamins and minerals. 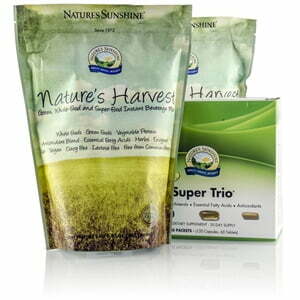 Super Trio includes three Nature’s Sunshine products, including Super Supplemental, Super Omega-3, and Super ORAC to supplement additional vitamins and minerals as well as to provide antioxidant protection. The Healthy Start program is a convenient method to support essential bodily functions and live a healthful life.